The 14-foot by 48-inch ClackaCraft Big Sky Drifter is an inexpensive driftboat that is ideal for use on smaller streams where turning radius is a factor. The Big Sky comes with either a bucket seat up front on a pedestal with storage inside or front bench seat. 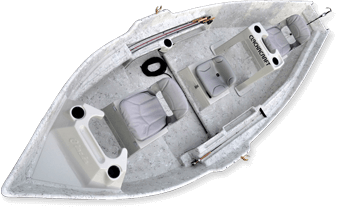 The oarsman’s tractor seat is on an adjustable bench with a tackle pocket on each side.